Cells of the human body exhibit three main types of movements, namely, amoeboid, ciliary and muscular. Amoeboid Movement: Some specialised cells in our body exhibit amoeboid movement, e.g. macrophages and leucocytes. Amoeboid movement is facilitated by pseudopodia formed by the streaming of protoplasm (as in Amoeba). Cytoskeletal elements are also involved in amoeboid movement. Ciliary Movement: Ciliary movement occurs in most of our internal tubular organs which are lined by ciliated epithelium. The coordinated movements of cilia in the trachea help us in removing dust particles and some of the foreign substances inhaled along with the atmospheric air. Passage of ova through the female reproductive tract is also facilitated by the ciliary movement. Muscular Movement: Movement of our limbs, jaws, tongue, etc, requires muscular movement. The contractile property of muscles is effectively used for locomotion and other movements by human beings and majority of multicellular organisms. Locomotion requires a perfect coordinated activity of muscular, skeletal and neural systems. Skeletal Muscles: Skeletal muscles are closely associated with the skeletal components of the body. They have a striped appearance under the microscope and hence are called striated muscles. As their activities are under the voluntary control of the nervous system, they are also known as voluntary muscles. They are primarily involved in locomotory actions and changes of body postures. Visceral Muscles: Visceral muscles are located in the inner walls of hollow visceral organs of the body like the alimentary canal, reproductive tract, etc. They do not exhibit striation and are smooth in appearance. Hence, they are called smooth muscles (nonstriated muscle). Their activities are not under the voluntary control of the nervous system and are therefore known as involuntary muscles. They assist, for example, in the transportation of food through the digestive tract and gametes through the genital tract. Cardiac Muscles: As the name suggests, Cardiac muscles are the muscles of heart. Many cardiac muscle cells assemble in a branching pattern to form a cardiac muscle. Based on appearance, cardiac muscles are striated. They are involuntary in nature as the nervous system does not control their activities directly. Each organised skeletal muscle is made of a number of muscle bundles or fascicles. These bundles are held together by a common collagenous connective tissue layer called fascia. 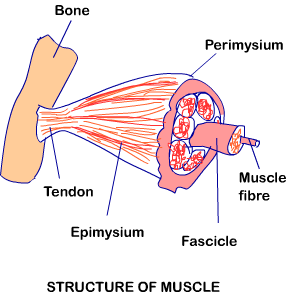 Each muscle bundle contains a number of muscle fibres. Each muscle fibre is lined by the plasma membrane called sarcolemma enclosing the sarcoplasm. 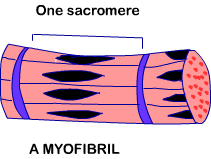 Muscle fibre is a syncitium as the sarcoplasm contains many nuclei. The endoplasmic reticulum, i.e., sarcoplasmic reticulum of the muscle fibres is the store house of calcium ions. A characteristic feature of the muscle fibre is the presence of a large number of parallel filaments in the sarcoplasm called myofilaments or myofibrils. Each myofibril has alternate dark and light bands on it. A detailed study of the myofibril has established that the striated appearance is due to the distribution pattern of two important proteins – Actin and Myosin. The light bands contain actin and is called I-band or Isotropic band, whereas the dark band called ‘A’ or Anisotropic band contains myosin. Both the proteins are arranged as rod-like structures, parallel to each other and also to the longitudinal axis of the myofibrils. Actin filaments are thinner as compared to the myosin filaments, hence are commonly called thin and thick filaments respectively. In the centre of each ‘I’ band is an elastic fibre called ‘Z’ line which bisects it. The thin filaments are firmly attached to the ‘Z’ line. The thick filaments in the ‘A’ band are also held together in the middle of this band by a thin fibrous membrane called ‘M’ line. The ‘A’ and ‘I’ bands are arranged alternately throughout the length of the myofibrils. The portion of the myofibril between two successive ‘Z’ lines is considered as the functional unit of contraction and is called a sarcomere. 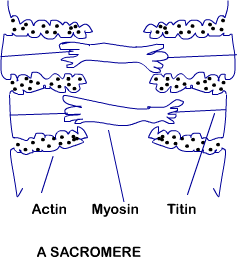 In a resting state, the edges of thin filaments on either side of the thick filaments partially overlap the free ends of the thick filaments leaving the central part of the thick filaments. This central part of thick filament, not overlapped by thin filaments is called the ‘H’ zone.